The EX1810R is a high current single output bench power supply in a compact case style capable of providng 180 watts of power. High power efficiency allows it to operate without any cooling fan. It can provide current of up to 10 amps at voltages up to 18V in both constant voltage and constant current modes. Switchable remote sense is provided to remove the effects of connection lead resistance at high current. 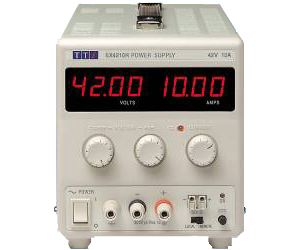 The EX-R series is an extension to the highly successful EX series of dc bench power supplies (see separate data sheet). To match their higher current capability, EX-R models include switchable remote sensing and extended voltmeter resolution. The EL & EX series has been designed to meet the stringent requirements of relevant IEC standards for safety and EMC. All outputs are intrinsically short circuit proof, and are protected against external voltages and reverse currents.